A 14-year-old sea cadet has died after falling overboard in the Solent. The boy, from Kent, was on the training ship TS Royalist which was anchored at Stokes Bay south of Gosport, Hampshire. He was climbing the rigging to bring in the sails when he fell 25ft (7.5m) into the sea on Sunday night. The crew retrieved him and sent a Mayday call. The Solent Coastguard helicopter took him to the Queen Alexandra Hospital in Portsmouth where he was pronounced dead on arrival. An investigation has begun. The teenager was one of 19 sea cadets and 10 staff onboard the brig, all from the south-east of England and aged between 13 and 18. They were celebrating the movement's 150th anniversary at the 2010 Sea Cadet Festival, which was held at Gunwharf Quays in Portsmouth over the bank holiday. Mike Cornish, chief executive of the Marine Society and Sea Cadets, said the accident happened during a standard exercise after setting anchor for the night. 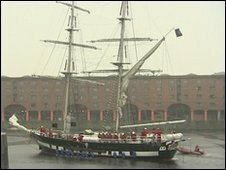 "The Royalist had anchored, the cadets went aloft to furl and reef the sails and unfortunately the cadet fell while aloft," he said. "He was rapidly retrieved by our own RIB and the crew of Royalist. "There was clearly major concern over his condition and the captain of Royalist called a Mayday." Mr Cornish said the boy would have been wearing a safety harness but the cadets did not wear life jackets when climbing the rigging in case they got tangled. He described the incident as an "extremely tragic accident" and said it was "appalling for all those involved". "The cadets are fully trained and will only climb the rigging if comfortable with climbing," he added. Colin Griffiths, coastguard watch manager, said the boy was transferred to the Gosport and Fareham Inshore lifeboat and then flown by helicopter to the landing site at the Queen Alexandra Hospital in Cosham." In a statement, the Marine Society and Sea Cadets said: "The charity is deeply saddened to report that a tragic and fatal accident occurred on sea cadet training vessel TS Royalist on Sunday. "The protection and safeguarding of young people is of paramount importance to the charity, and we take our duty of care very seriously. "TS Royalist is staffed by experienced and qualified crew. "This tragic fatality is the first the ship has experienced since she was commissioned in 1971. "Our thoughts are with the young cadet's family at this distressing and painful time. "The charity is now working with the Maritime Accident Investigation Branch to establish the full details of what happened and offering every assistance to the local authorities and police." The ship set off on the training exercise on Friday and was meant to return a week later. However after the Sunday's incident it returned to shore and the remaining youngsters disembarked to be reunited with their families. A spokesman for Hampshire Constabulary said the boy's parents had been told. He said: "The Marine Accident Investigation unit and Hampshire Constabulary are fully reviewing all of the circumstances surrounding the death and the coroner has been notified."